Apple’s iOS drives most of the revenue of all mobile platforms, Opera Mediaworks’ Q3 State of Mobile Advertising report has found. Although iPhone and Android are neck and neck in the race for smartphone dominance, when it comes to mobile platforms, iOS dominates: it grabbed 44% of all ad requests and 49.53% of all revenue from Opera’s platform. 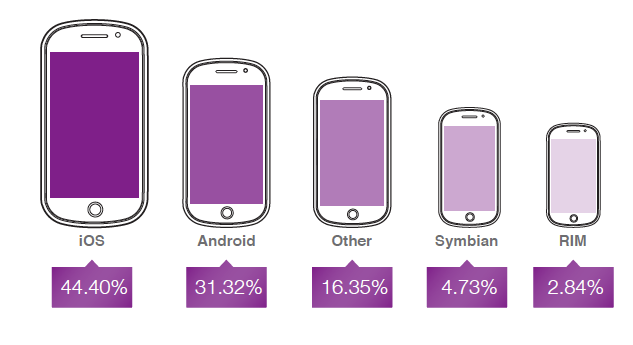 When breaking this down to devices, the race for market share between Android and iOS looks slightly different: the iPhone was left behind by Android in terms of traffic, as the latter captured 31.2% compared to the iPhone’s 31%. However, Apple’s smartphone recoups the lost market share when it comes to revenue: 36.9% vs. 27.73%. What is worth noting is the rise of the iPad and the tablet market. About a year ago, tablets accounted for just 5% of total impressions. Since then, tablet devices have doubled their market share and now account for 10% of all impressions. The iPad once again outperformed its competition by grabbing 8.87% of all impressions, while other tablets have only 1%. On the revenue side, the iPad excels again, driving 10.33% of all revenue compared to 0.46% recorded by other tablets. An interesting highlight of the Opera study relates to the growth of iOS 7: Apple’s latest mobile OS was released on September 18 and became the dominant OS version for Apple devices, grabbing 61.08% compared to 33.01% of iOS devices running iOS 6, within just 12 days. In a separate report Nanigans, one of the biggest buyers of Facebook ads, found that iOS generates significantly more return on investment compared to Android. In fact, iOS averaged 17.9 times higher than Android, the Nanigans study reveals.